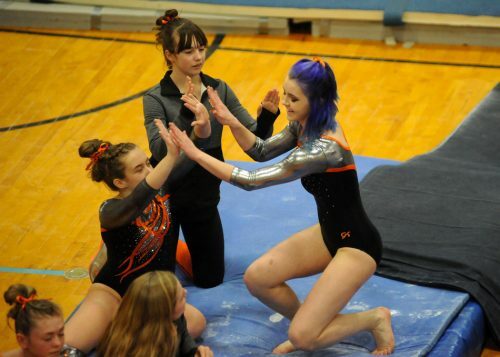 LAGRANGE – Much went as expected at Saturday’s Lakeland Gymnastics Invite. But some unforeseen issues may cloud the next round. 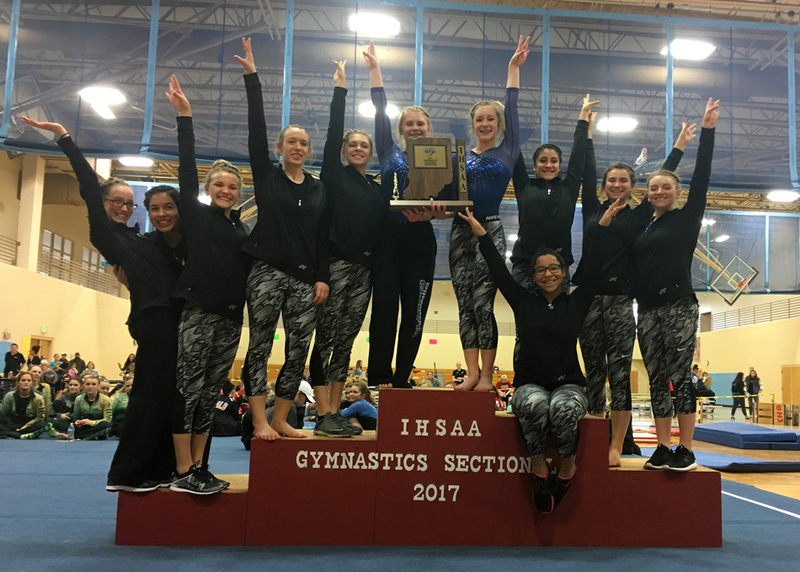 Elkhart Central won the team title as most figured, scoring 109.625 points to run away with its third straight sectional trophy. The Blazers were as advertised, outscoring everyone in each category and putting three in the top six of the all-around scoring. 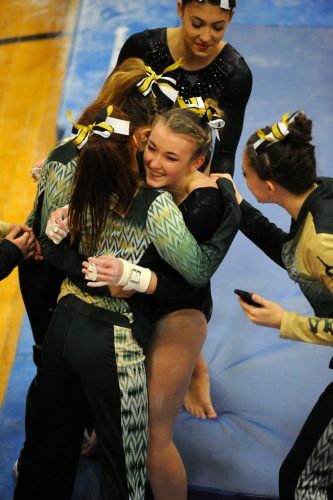 Wawasee was second, led by its duo of Reagan Atwood and Jada Parzygnot, with 106.25 team points and East Noble snared the third team ticket to regional with its 101.50, well ahead of Lakeland’s fourth-place tally of 98.825. Elkhart Central’s Skiler Reveal on beam. Central used its big four of Analena Vanderzwaag, Abi Downs, Kiana Stabler and Skiler Reveal to pile up its dominant showing. Vanderzwaag, referred to by one of her supporters as ‘The Flying Dutchman’, was the all-around champion at 36.65 and took the floor title at 9.65. The sophomore placed no lower than fifth on any event to pace the Blazers. Downs and Stabler were second and third in the all-around at 36.6 and 36.375, respectively, and Reveal finished just outside the top six with a 34.375 in seventh. As good as Elkhart was, they became part of the backstory to the sectional as Downs became the third stud at the meet to go down with an injury. 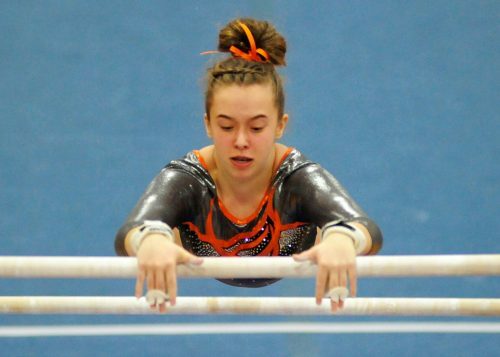 After whizzing through her bars routine that scored her an 8.9, upon dismount Downs hit the deck and didn’t get up for several minutes with discomfort in her knee. The sophomore was said to be OK by Central head coach Kathy Krauter, likely able to return to action for the regional next Saturday, but will have to take it slow. The MVP of the meet may have been athletic trainer Mandy Scher and her staff, as Downs was the third crowd silencer of the afternoon. Opening the meet, East Noble’s Elizabeth Molen injured her knee in a tumbling pass on the floor and did not return. Shortly before Downs went down, Lakeland ace Whittney Ray was in a heap off the vault landing pad, also needing attention to a knee she slammed into the gym floor on her dismount. Toss in Warsaw’s ace, sophomore Remi Beckham, who didn’t even compete because of an injury suffered before the sectional that has her shelved for three weeks. Wawasee’s Reagan Atwood is mobbed by her team after her bars routine. Wawasee managed to escape the injury bug and put together a fine performance that will have it in the regional for the second straight season. Atwood was spectacular right out of the gate, scoring a 9.6 on floor that was short of only the Dutchman’s tally in the meet. With the entire sectional watching, Atwood scored a 9.1 on beam and offered a rare fist pump after her dismount to close the meet, garnering second place in the event to Kyle Heckaman’s 9.125, Plymouth’s lone advancing score. Atwood also had an 8.7 on vault and 8.7 on bars. 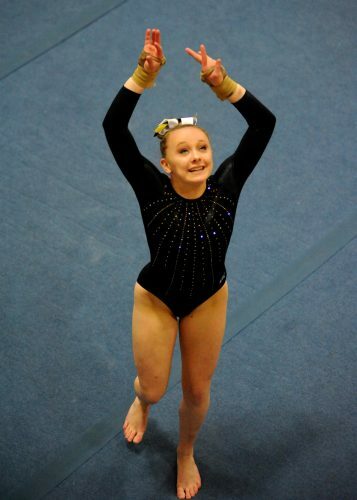 The junior was fourth in the meet with a 36.1 all-around score. Parzygnot knocked off some rust from an up-and-down February to put together a top-five sectional showing. The sophomore was tied with Stabler for second on bars at 9.1 and opened her day with a 9.4 on floor that seemed to do the trick. 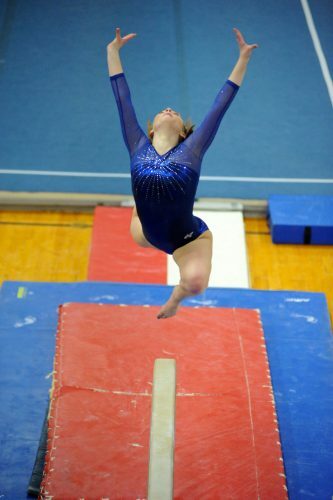 Parzygnot added an 8.5 on beam and 8.9 on vault to finish at 35.9 in all-around, fifth-best in the sectional. Without Beckham, Warsaw fell off the pace with a 96.025, seventh-place team score. The Tigers had a trio of girls lead in scoring, with Daylen Turner posting the highest number at 8.65 on vault to also finish highest on any list in tenth place. Megan Metzger led on beam at 7.65 and 8.0 on bars and Anna Wainscott scored an 8.375 on floor. New Prairie’s lone wolf, sophomore Ali Palmer, won the bars at 9.2, was tied for fourth on vault at 8.9 and snuck into the all-around top six with a 35.3, advancing to the regional for the second time. 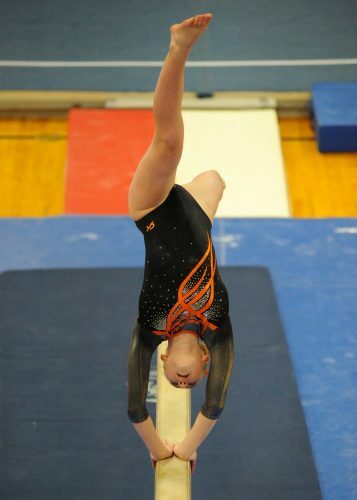 Palmer was the regional beam champion last year. DeKalb’s Shiloh Miller won the vault at 9.35 and was sixth on floor with a 9.325. Miller’s teammate, Kristen Azzue, slid into the regional in sixth on beam at 8.8. 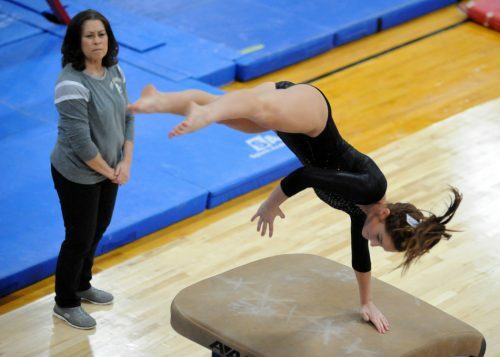 The Huntington North Gymnastics Regional is Saturday, March 4, with the same standards of advancement: the top three teams and the top six gymnasts in each event qualify for the IHSAA Gymnastics State Finals on March 11 at Ball State University.